The first full official history of MotoGP from the earliest days to now. From the first World Championship race, through to the Honda vs. MV years, the two-stroke revolution, the vast array of personalities and neon leathers of the 1980s, and the reign of Rossi, all the way to today's stars this is an incredibly exhaustive and detailed production. This exciting and action-packed documentary is packed with facts and information, from which even the most knowledgeable racing fan will learn something new. 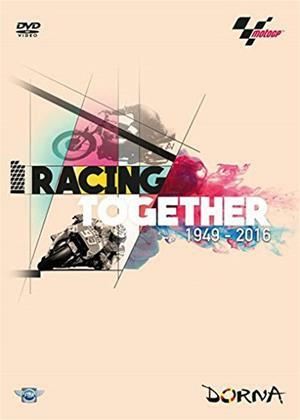 MotoGPTM has its roots in the FIM Motorcycle World Championship established after the Second World War, and which soon blossomed to become the biggest and most prestigious motorcycle Championship. The esteem in which races are held hasn't changed much since those first days, but virtually everything else about premier class racing has. In the early years there was just two classes, 350cc and 500cc, but over time various other capacities have come and gone until today's arrangement of MotoGPTM, Moto2TM and Moto3TM. Another momentous change has been the switch from thrilling but deadly road circuits to purpose-built short courses and an ever-increasing emphasis on rider safety. This feature-length documentary looks at the changing face of World Championship motorcycle racing, and at the forces that have motivated this evolution. Along the way, we also meet a cast of characters that made MotoGPTM so compelling and so endlessly fascinating since its humble beginnings.